Persistence Market Research presents a one of its kind and a comprehensive report on the U.K. private healthcare market titled ‘Private Healthcare Market: U.K. Industry Analysis 2012 – 2016 and Forecast 2017 – 2025’. The report starts with an executive summary that presents key findings related to the U.K. private healthcare market such as pertinent market numbers and the CAGR of this market from 2017 till 2025, and market forecast numbers related to the various segments. The executive summary also lists the various drivers, restraints and trends operating in the U.K. private healthcare market that gives a cursory overview of the factors influencing the growth of this market. Also, a list of prominent market players operating in the U.K. private healthcare market is given in the executive summary. The executive summary also lists the U.K. private healthcare market split by service type, by application and by end user for the year 2017. Persistence Market Research forecasts the U.K. private healthcare market to grow from more than US$ 11,600 Mn in 2016 to over US$ 14,000 Mn by 2025 end. This represents a CAGR of 2.8% over the forecast period. The increased interest of patients to self-pay for various ailments in recent times is expected to advance the private healthcare market in the U.K. Moreover, private hospitals are coming up with package price and fixed consultant fees for certain types of treatment and after care, which allows patients to choose best offerings in the market. Private hospitals give choices to patients to take this self-pay route for non-urgent operations. Increase in self-pay elective procedures is driven by growing NHS waiting list and growth is supported by packaged pricing and marketing initiatives of private hospitals in the U.K.
Of late, the private healthcare sector is witnessing a strong growth in NHS GP referrals owing to long NHS waiting list, which is increasingly turning patients to the private sector. The e-Referrals system allows patients to choose the time, date, and hospital/clinics for the required treatment, thus helping patients make informed decisions. For instance in 2016, BMI Healthcare, a private healthcare provider’s NHS case load increased by 6.6% overall on a Y-o-Y basis and the e-Referrals caseload (through which patients choose and book their preferred facility) increased by 9.5% on a Y-o-Y basis. NHS admissions are expected to grow at current rates as patients and GPs are increasingly opting for the private sector in the e-Referral process. Private Medical Insurance (PMI) is the largest payer of healthcare services in the U.K. private healthcare market. The ongoing decline in medical cover pay-outs to hospitals and clinics over the past five years and decline in individual purchase of private medical insurance are expected to hinder the private healthcare market over the medium term. Moreover, decline in PMI funded inpatient and day case caseload owing to ongoing funder cost management and additional premium tax are expected to impact the private healthcare market negatively. Apart from the aforementioned factors, relatively few companies offer continued support for private medical insurance beyond retirement age, and individual premiums rise sharply with age and medical history. The people who benefit from private medical insurance are thus concentrated in the 30- to 64-year age group with relatively few people covered past retirement age, which may affect the market negatively over the forecast period. Increasing waiting times for various treatments and procedures at NHS is prompting patients to adopt private healthcare services in the U.K. The rising waiting time beyond the 18 week target would provide significant opportunities for private healthcare providers to bridge the ongoing gap between NHS targets and infrastructure. According to NHS England, the number of patients not receiving treatment within 18 weeks of referral has gone up by 100,000 since January 2016. For instance, analysis by the Royal College of Surgeons found that over the past year an average of 193,406 people a month did not get surgery within 18 weeks of being referred. Moreover, the number of patients waiting for operations is expected to increase significantly in the near future, which is expected to create growth opportunities for private healthcare providers. The Others segment dominated the U.K. private healthcare market by application in terms of revenue in 2017, and this trend is projected to grow throughout the forecast period. Others segment is the most attractive segment, with attractiveness index of 2.7 over the forecast period. Others segment is estimated to account for 35% market value share in 2017. Trauma and orthopedics segment is expected to be the second most lucrative segment in the U.K. private healthcare market by application, with attractiveness index of 2.0 during the forecast period. 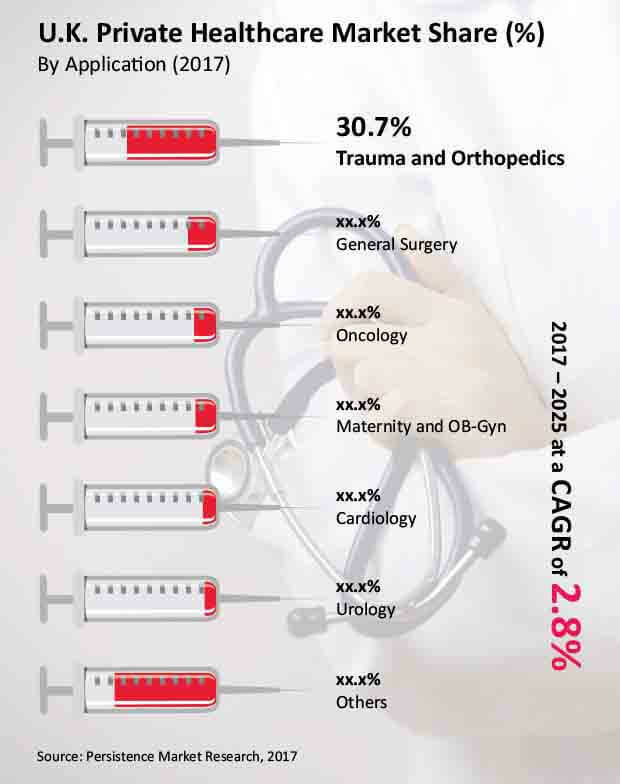 Trauma and orthopedics segment is estimated to account for 30.7% market value share in 2017. The growing confidence among foreign patients regarding the private healthcare sector in the U.K. is expected to boost the market over the forecast period. To address the growing needs of foreign patients, several large London based hospitals have increased intensive care facilities. Moreover, government initiatives like upfront charges for NHS foreign patients and long NHS waiting times are expected to prompt foreign patients to avail private healthcare services in the U.K. Growth is being driven by an increase in self-paying overseas patients, particularly from Middle Eastern countries, as London builds on its reputation as a global center for healthcare excellence.